Free Spirit, the frequent flyer program for Florida-based budget carrier Spirit Airlines, is very controversial. On the one hand, it is very restrictive. Your miles expire after only three months of inactivity, unless you have the Bank of America Spirit Airlines World MasterCard (see below). Most programs give you at least a year, and some up to two years. On the other hand, Free Spirit miles can give you amazing and unbeatable value if you’re in the right place at the right time. How Can You Use Free Spirit Miles? The best use of your way Free Spirit miles is booking nonstop flights, because the airline has a region-based program: The miles needed for an award ticket is based on how many miles the flight is. If you live in or near one of Spirit Airlines “focus cities,” you’ll have more options and will get the most benefits out of the program. Booking a flight in conjunction with the carrier’s co-branded World MasterCard issued by Bank of America offers the best value. As the chart below illustrates, as the Bank of America Spirit MasterCard holder, not only you will be able to easily extend your expiration date indefinitely, you will also get rock-bottom redemption rates and earn 100 percent of miles flown on revenue flights. You’ll get the best value for your miles by redeeming them for flights within the same region. Regions are determined by the amount of miles covered in a flight, and the fewer miles, the cheaper the flight. For example, a round-trip award flight between New York and Miami/Fort Lauderdale costs just 5,000 Free Spirit miles. The same route costs 15,000 miles on British Airways, and 25,000 miles on American, United or Delta. You might not want to redeem Free Spirit miles for flights across more than two regions. Not only are those awards more expensive and hard to come by, but connecting times can be very inconvenient. There are two elite levels in the Free Spirit program: Elite and VIP. To become an Elite level member, you have to make at least one card purchase per month on the Spirit MasterCard, or within the preceding six-month period earn 12,000 Free Spirit miles or spend at least $1,200 on base fares. For VIP status, you must earn 24,000 Free Spirit miles or spend at least $2,400 on base fares over the preceding six months. 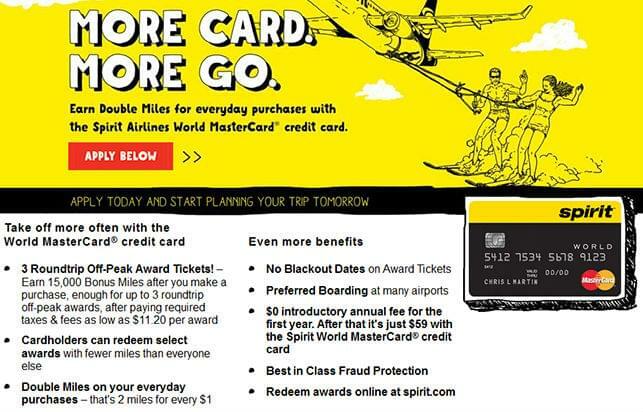 Spirit Airlines has one co-branded credit card: the Bank of America World MasterCard. In addition to a 15,000-mile sign-up bonus and waiving of the first year’s annual fee, if you are an airline credit card cardholder, you can get award seats that can be redeemed at lower rates. Your miles will never expire as long as you make one purchase on your card per month.